One of the great delights of working with a large animal is that you can get cuts off it you cannot with a smaller one. In my world, the greatest place I see this is in the difference between a deer and, say, an elk or moose. I recently shot a cow elk in Oregon, and was stoked to finally be able to cut my own flat iron steaks from it. Flat iron steaks, if you have been living under a rock — or just don’t eat in restaurants — are super trendy. They are a sinew-free steak cut from the shoulder blade of an animal. Why so trendy? Because the shoulder is a working muscle, and working muscles have more flavor. I hear the tenderloin partisans hollering. Yeah, I like tenderloin, too. But remember, there is a saying among chefs that the filet mignon, the tenderloin of a cow, is the Paris Hilton of steaks: Everyone wants it… but no one knows why. 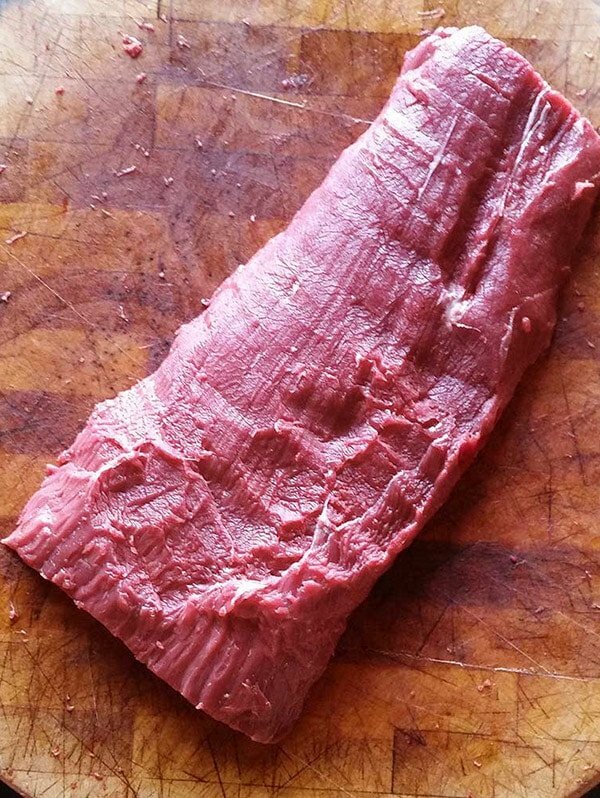 Flat iron steak has many names. In Britain it is called the butler’s steak, the paleron on France, the oyster steak in Australia. 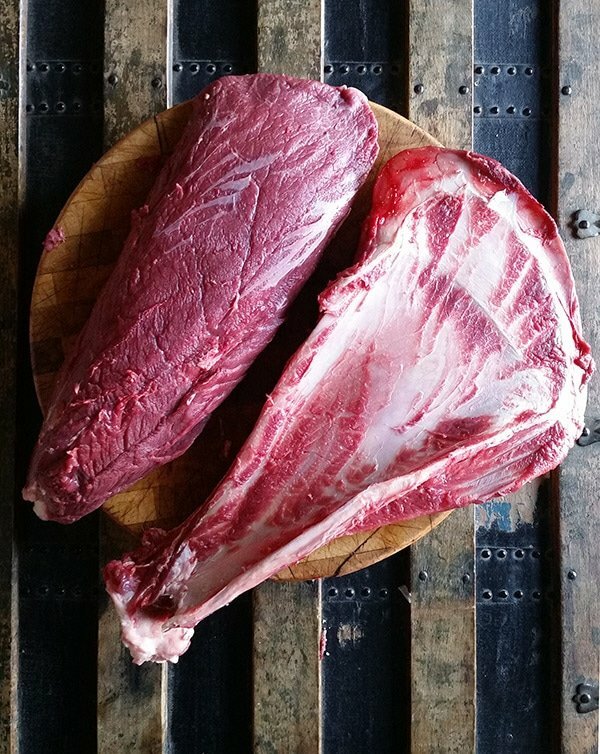 According to the beef mavens, it is indeed almost as tender as the Paris Hilton tenderloin, but with way more flavor — again, because it comes from a hard-working muscle. 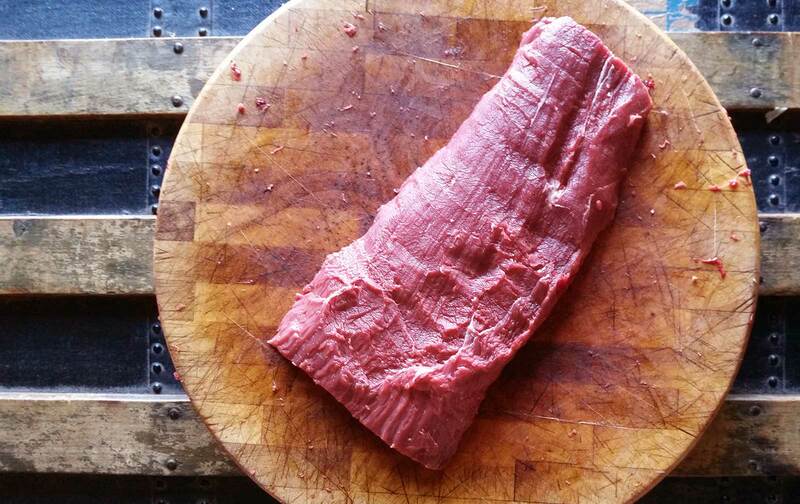 You can’t really cut a flat iron steak from a deer or lamb because they are just too small, with rare exceptions. You need an animal at least 400 pounds, in my opinion, to make it worth your effort. So cattle, caribou, elk and moose are what you are looking for. First thing to remember is that the flat iron steak comes from the shoulder. Second, that it is a component of a blade roast. The blade roast comes from, yeah, you guessed it, the shoulder blade. Specifically the wide part of the paddle. Work your way through an elk or moose shoulder until you see this muscle. Fillet it off the scapula (shoulder blade) in one piece. Looks lovely, yeah? Sadly, it looks better than it is. You see, there is a gnarly line of sinew and cartilage running right down the middle of this roast. It’s so tough it will defeat your steak knife. It has to go. 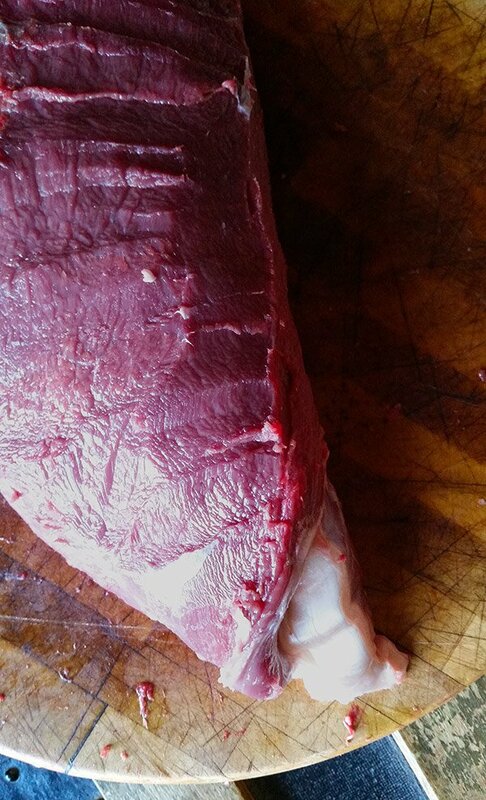 You do this by starting at the narrow end of the roast, where you can see the cartilage at its thickest. to cut my flat iron steaks. Now you have two sinew-free steaks, one larger than the other. All you need to do to finish the flat iron steak is to square it off. The yield on my cow elk was two one-pound steaks, and two closer to a half-pound. You’ll notice a strong grain in your flat irons, which is great: After you grill or saute this steak, you slice against the grain and have yourself a piece of my favorite steak on the whole animal. Enjoy! 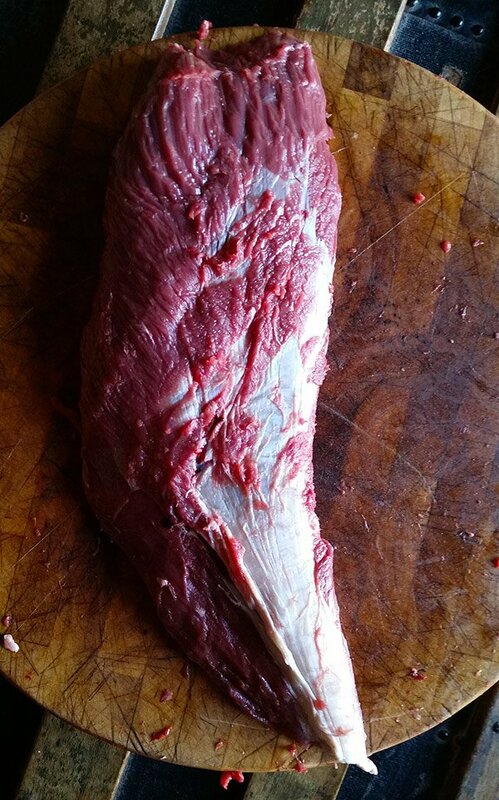 I love this cut for making venison fajita’s and that works well for normal sized deer. Just take those smaller steaks, season them up, sear and slice for fajita’s. Ah, thank you! Ever since preparing your fabulous venison shanks, I’ve been wondering what else I’ve been grinding up and missing out on. This would be one of those. Look forward to trying! My wife bought me your book and I have enjoyed it so much. You have so many Ideas on how to cook your game. I have used your recipes so many times that I just wanted to say, keep up your great work on presenting your readers with so many ideas on outdoor enjoyment.